Harlem, NY rapper. December 2008 Source Unsigned Hype. 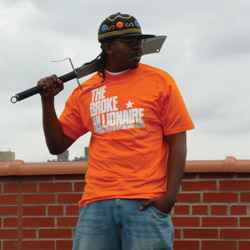 Swave is the leader of the notorious battle rap crew, TEAM HOMI. He is also part of Stronghold, CVees, Rebel Armz, Outpost, Heatrock Monstaz, & Triggacons. Swave has battled for various battle rap leagues from Grindtime, URLTV, & KOTD.